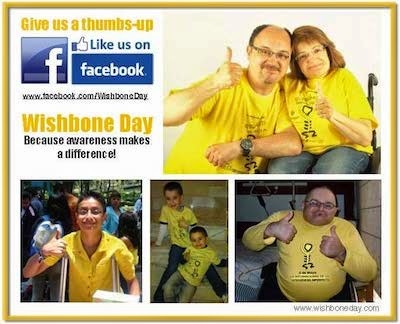 We're excited to see the increased number of Wishbone Day images creeping across the world to raise awareness of OI. We love the posters and various art works being created as individual expressions of Wishbone Day. This is important to protect the Wishbone Day image/logo and how it is used, to make sure that people know how to find us and to keep Wishbone Day moving in the right direction. Don't forget to check out our image conditions of use. Thanks! Got any questions - just hit up the comments section below and I'll make sure I respond asap! On Wishbone Day, 6th May - We say STOP!